Poor Superman. The quintessential grandfather of the American comic book superhero, the character whose appearance in the debut edition of Action Comics in 1938 gave rise to an entire pantheon of costume-clad super heroism, has struggled to find acceptance. Emerging as a symbol of hope and optimism against the backdrop of World War II, Superman has recently been relegated by many audiences, dismissed as outdated, branded as un-engaging and difficult to dramatise. With a feeling of justice, then, comes Man of Steel, a big, bold, epic treatment from the co-writer of The Dark Knight trilogy (and indeed produced by its director, Christopher Nolan) that promises to be invigorated, modern, and triumphant. Director Zack Snyder’s brand of slick action has been applied to the story’s pulp origins, and it is indeed the pulp fictions of a bygone era that are foregrounded during the film’s early scenes on the planet Krypton. Visuals are big and other-worldly, dialogue monosyllabic as if ripped from the speech bubbles of a comic. For the first twenty minutes or so, this is business as usual: grand, lavish, sincere comic book entertainment. Only once Krypton meets its inevitable end and the baby Kal-El is shipped to Earth does Man of Steel carve itself a new path. Solemnity suddenly replaces lavish fun and the relaying of plot points replaces sweeping pulp storytelling. The grave despair of Henry Cavill’s protagonist replaces the warmth and wit of Christopher Reeve’s much-loved incarnation from yesteryear. Donning the cape and tights for the first time, Cavill impresses in the role, offering a more physical embodiment of the iconic hero, yet the passivity that defines this modernised version ultimately makes his Superman far more difficult to root for than one might have expected. Some will despair, too, over the lack of tangible chemistry between Cavill and Amy Adams’ Lois Lane - the latter neatly shoe-horned into the narrative as the journalist sent to tracking down the wandering hero. Adams is perhaps the best actress to have played the role, yet hers is the least memorable interpretation to date. This Clark Kent - or Kal-El, as he is known more prominently - remains distant, internalised, and, well, alien. What few scenes are reserved for the building of character - including a handful with Kevin Costner’s Jonathan Kent, who shines with limited screen time, providing the film with some much-needed warmth and depth - are mostly drowned out by their need to be as noisy as possible, with even the most intimate of moments taking place in the midst of drowning buses and fatal hurricanes. More optimistic is the fact that much like Nolan’s The Dark Knight (2008), Man of Steel represents a subtle and innovative genre shift from many other superhero blockbusters. 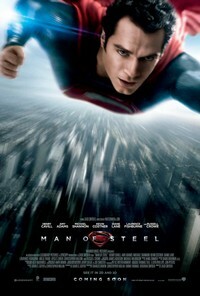 While former strode gallantly towards the crime film, Man Of Steel strives - admirably - for science fiction. This is a film founded upon potentially fascinating questions specific to both the genre of science fiction and the cultural zeitgeist of modern America, and the exploration of these makes for a dramatically bold and thematically unique narrative trajectory. Infuriatingly, it doesn’t last, for in addition to such science fictional trimmings, the film also attempts to staple a more traditional, often heavy-handed, and far less original interpretation of the Superman mythos to the fabric of its cape - one rooted in the generic vein of fantasy that best characterised Richard Donner’s Superman (1978), together with more recent super-heroic antics such as The Avengers (2012) and Thor (2011). It is here where Man Of Steel also abandons its aim of probing its earlier questions for the sake of action sequences, struggling to determine either a meaningful message or a coherent thematic thread to carry the narrative towards its conclusion. What becomes most apparent is that the humanity of this man of steel is missing, his heart replaced with a dour tone that convinces neither as challenging sci-fi nor as fantasised escapism. Poor Superman indeed.